Hi guys, I hope you are all having a nice week. I thought it would be a really nice change to focus on a male gift guide. I previously made a Christmas male friendly gift guide here but I wanted to get up close and personal with a few products today. I actually used Ollie as a guinea pig for a few of the skin care products and overall, I am really pleased with my gift idea suggestions so I hope you find this post helpful! 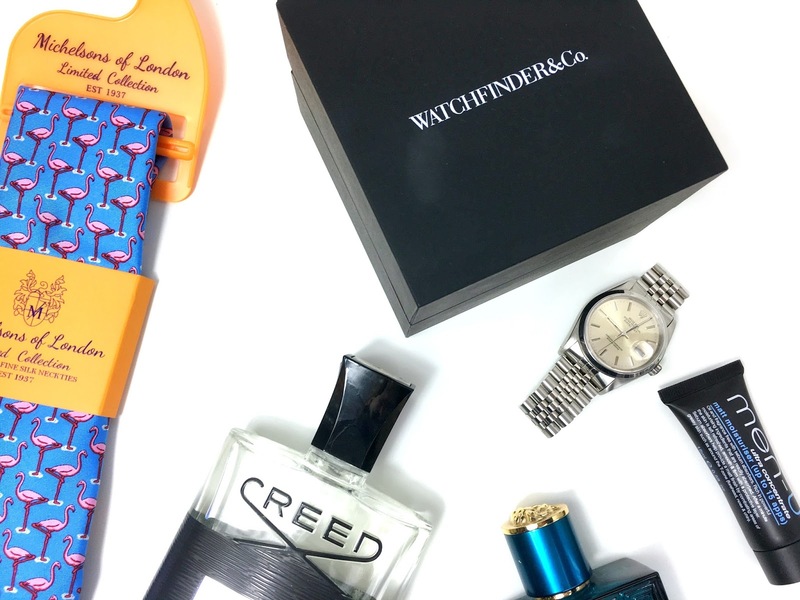 I wanted to mix a few luxury items in this post because I'm slowly starting to appreciate luxury gifts compared to high street finds. Although I've always been a high street girl, I do think some items just can't be beat by a higher end brand, especially when it comes to wallets, watches, sunglasses or aftershaves. That being said, I have included a few purse friendly options too. Let's get started! Now I wanted to start with the Rolex. Ollie bought this watch last year and I am not saying you need to buy your boyfriend/husband/dad/brother etc. a Rolex watch, but if you are looking for a watch, I do think WatchFinder is a pretty amazing place to start. Without fail, Ollie scrolls through WatchFinder every night looking at Cartier and Rolex watches. If you visited the official Rolex website right now, you can find a selection of watches in a pretty high price bracket but if you have your heart set on a luxury watch, you can find a pre-owned version on WatchFinder for a cheaper price. If you don't have much experience with watches (like myself), then WatchFinder actually review them on their Youtube channel, pretty nifty right? The Rolex photographed is the 1990 Date Just version but I've included the WatchFinder Youtube review of the Rolex Daytona 116500 below and also WatchFinder's summary on it. "When Rolex unveiled the Cosmograph Daytona 116500 LN in early 2016, it had been at the top of many watch wish lists. Offering the much anticipated and iconic combination of a steel case with a black ceramic bezel, the watch’s design pays tribute to the style of vintage Daytona models, uniting nostalgia with effortlessly cool, contemporary good looks—not to mention exceptional Rolex engineering in the form of the automatic calibre 4130. It’s the kind of watch that suits a broad range of tastes." For the other gifts, I wanted to talk about ties. I am starting to really appreciate Ollie's tie collection, he has got quite a few and he was pretty pleased when he found this Michelsons of London tie in Tk Maxx but if you want more options, visiting Michelsons of London directly is your best bet. I was having a looking through their website this week and oh my, they really do have a beautiful selection! Now when it comes to buying skin care, I really like to know whether the product is suitable for the person I am shopping for. Ollie is always travelling for work so if I am looking at products for him, travel size versions certainly go down well. For my dad, he is really into classic skin care products, he is a big fan of moisturiser and sticks to his routine but I think Ollie is definitely more on the practical side. 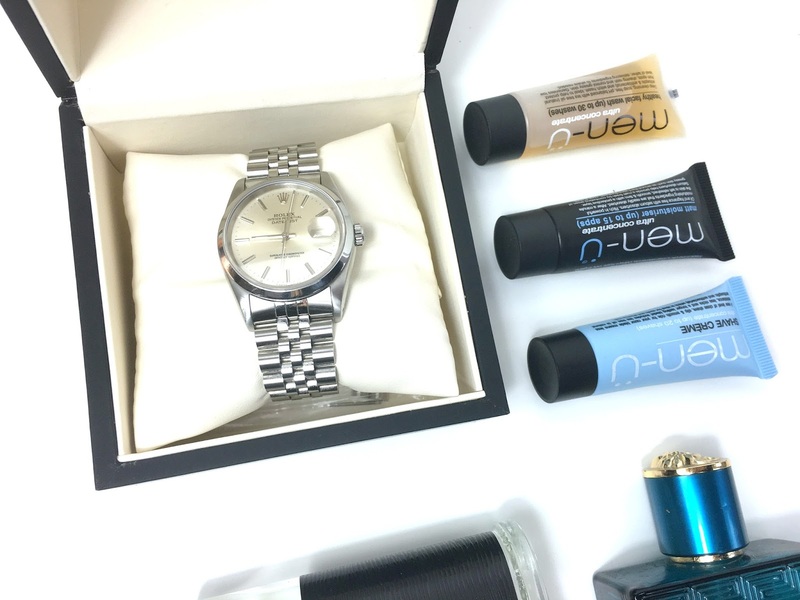 I was really excited to test the men-ü Selection Box* because it looks like a great kit for covering your skin care needs. The box includes a shower gel, shaving creme, facial wash, matt facial gel, facial moisturiser, matt moisturiser and a clay mask. For £19.95 you can't go wrong and the box gives you a chance to really try different products out of your comfort zone. Ollie loved the clay mask and he was really surprised how easy it was to use. Great picks! That tie is fantastic!